Visit Our Lady of the Rock island and church with ease on a speedboat tour. Depart from Kotor to the old town of Perast. 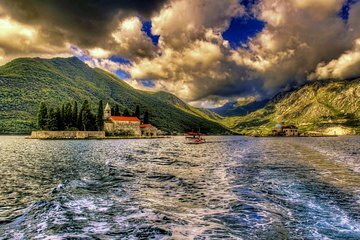 Admire the panoramic views of the Bay of Kotor as you cruise on the boat. Explore the church and small island. Afterwards, stroll through Perast’s old town. The tour guide was very knowledgeable. i enjoyed the tour. This was a fun tour! We liked it because of the speed of the boat. We were there from a cruise ship so time is precious. It's a very quick ride there and back and gives time left over for Kotor. The only thing that didn't go perfectly was the weather. Unfortunately it rained on the way back so we got wet, but it was fun anyway. Very nice man who owns this business and very nice guy who piloted the speed boat. The church was interesting and the story about how it came to be there was interesting as well. We would definitely recommend this to others! It was a speed boat ride. When we arrived the host told us they didn't know what time we coming, but we had booked the tour several days in advance. Lifejackets were not provided. The tour seem unorganized. Kotor is beautiful though.